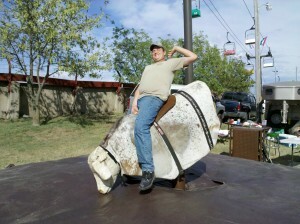 BMB Mechanical Bulls offers mechanical bull rentals all over Idaho. We have operated our bulls at the Simplot Games in Pocatello, Country Night at the Boise Hawks minor league baseball team, Brigham Young University-Idaho (BYU-I) in Rexburg, and the Hoedown at Idaho State University (ISU). We also go to corporate parties, weddings, reunions, fairs and graduation parties in Idaho. We carry all the necessary insurance as well as always bringing a mechanical bull suited for the type of event we are attending. We have both new and used bulls at our disposal. In addition to renting, we also sell and lease mechanical bulls. Contact us today for used mechanical bull availability and pricing.